Edraw is absolutely the quickest and easiest chart software for Linux, which provides various standard chart symbols and professional-designed chart templates to help uses get a quick start. 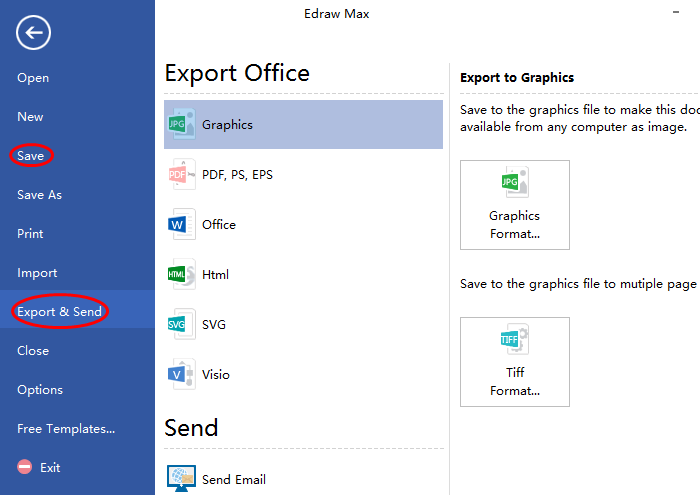 Edraw chart software for Linux is an all-inclusive chart maker. Users can create many types of charts with it, such as column chart, pie chart, area chart, pyramid chart, line chart, scatter chart and so on. 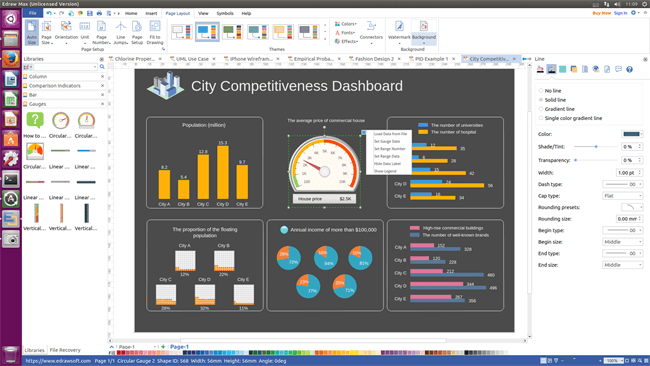 It enables users to create professional and resourceful chart with just several minutes, no matter you are skilled or without any drawing skill. Here lists several superior features of our Linux chart software that preferred by most users. Welcome to download and try it for free. The price of Edraw is much cheaper than most of chart makes works on Linux and users can enjoy a lifelong upgrade guarantee once buying a lifetime license. It enables users to analyze the market effectively by visualizing market moves, potential breakouts and related numbers. Users can create their chart with built-in chart symbols and professionally-designed chart templates instead of starting from scratch. Edraw supports inserting hyperlinks, images, notes and attachments to make chart more impressive and keep audience engaged. Multiple common file formats import & export and real-time collaboration makes chart share can be conveniently finished with one click. Abundant vector chart shapes are grouped into different chart types in the left libraries of Linux chart software. And all of them are royalty free, people can easily drag, drop and edit them as they wish. There is no need for users to worry about if they can not find the shapes they want cause Edraw has humanely prepared a set of drawing tool for them to free design. Creating chart on Linux can be extremely easy with Edraw since it has almost set everything ready. Let’s take area chart as an example. Start Edraw, go to File menu > New > Chart, and then double click area icon under templates window to open a blank drawing page. 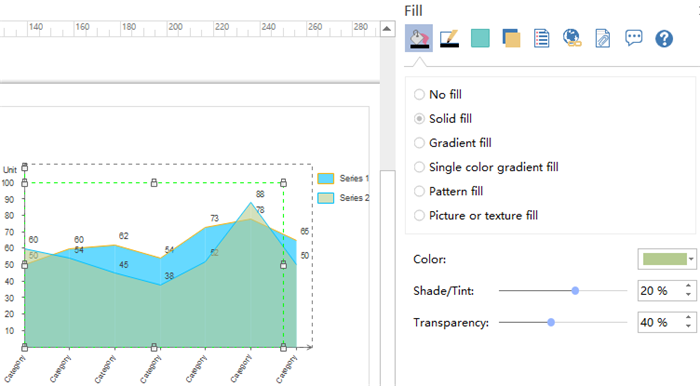 Drag an area chart shape from left libraries and drop on the drawing page. Edit the data to fit your needs. Area will be changed according to the data change. Go to the right sidebar and set the area color to make them more visual. Users can also navigate to Page Layout and change the theme if necessary. Following are chart examples created by our chart software for Linux. 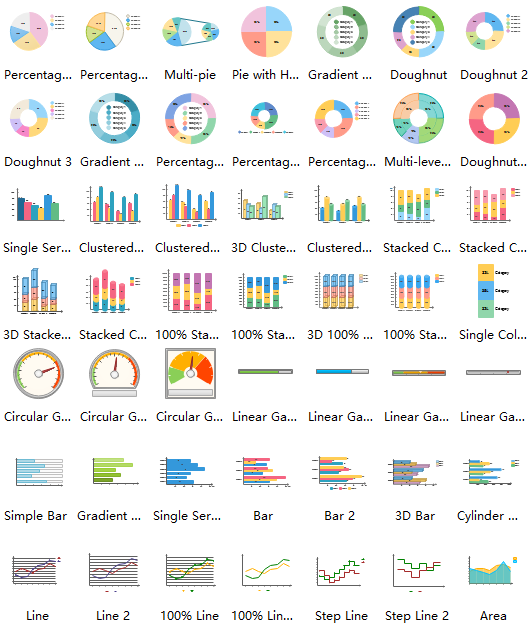 All the examples are different chart types and free to download & customize. 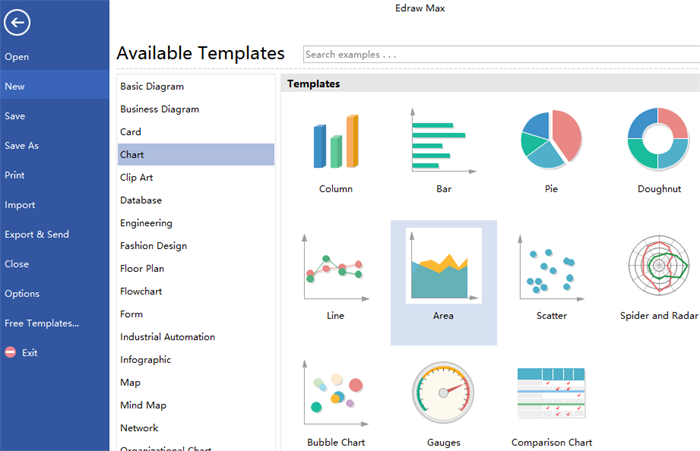 Users can download them and learn to create their own charts. The first one is 5W chart. It is one of the most useful chart in helping cultivate the logical thinking of students. 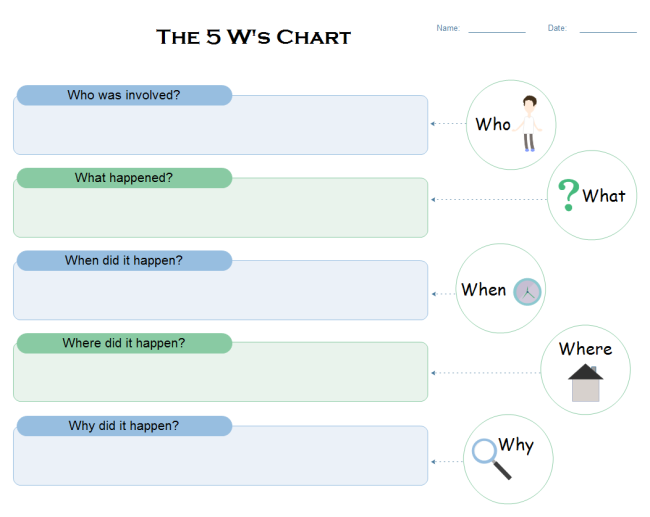 Teachers can list out the all 5W: Who, What, When, Where and Why, then the whole thing is obvious right now. 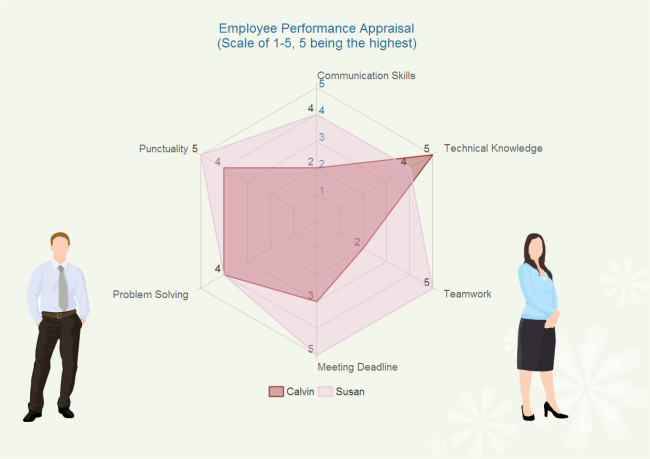 The second one is a performance appraisal spider chart. It is suitable for company owners to evaluate the performance of his employees from different aspects. 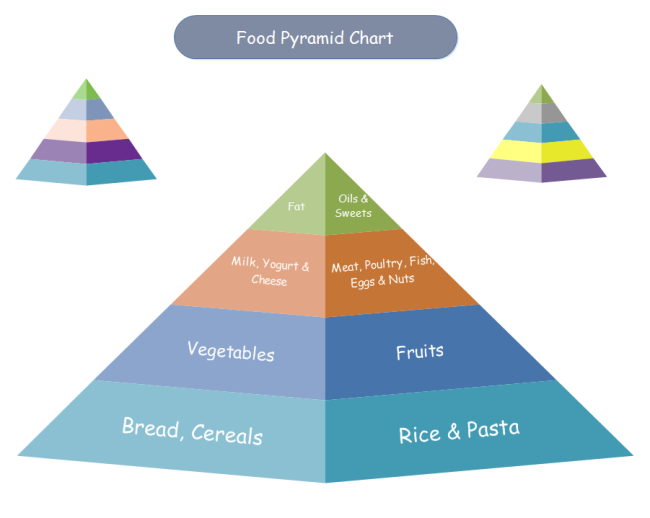 The third one is an exquisite food pyramid chart. People can easily know what kind of food should be ate more from it.